Modular 304 stainless steel 4” square x 1/4” wall structural tube main frame. All structural welds are continuous TIG, no pits, cracks, or crevices permissible. Equipment rated for Class I & II, Div. II, Groups C, D, F, & G service. 1-ton Harrington air hoist with powered trolley. 304 stainless steel Spider-Lift™ bag lifting frame requires less headroom than other designs. 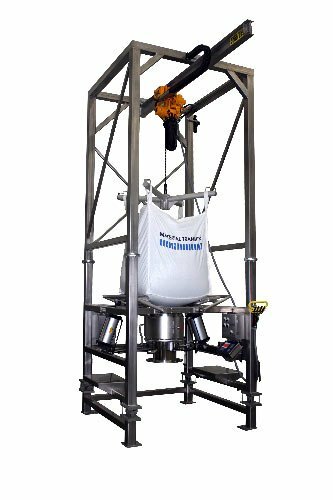 304 stainless steel Flo-Master™ “breaker-bar” bag massaging system breaks up clumps and promotes material flow. 304 stainless steel Flo-Lock™ pneumatically actuated slide gate quickly halts material flow for partial bag discharge. 316 stainless steel Seal-Master™ bag spout access chamber with “gull wing” doors for easy operator access. 316 stainless steel Sure-Seal™ pneumatic clamping system seals bag discharge spout for dust-tight discharge. 316 stainless steel product discharge transition. Loss-in-weight load cell scale system with summing box and weight indicator. Integral shelves for easy scale system calibration. Intrinsically safe pneumatic control package. Unit features 316 stainless steel pneumatic tubing and fittings for enhanced corrosion resistance.